After a drop in engagement last year, employee engagement globally bounced back to reach its peak of 65%, Aon’s 2018 Trends in Global Employee Engagement Report found. Analysing more than 8 million employees at over 1,000 organisations globally, the report revealed the global improvement in engagement is largely attributed to the overall improvement in the Asia Pacific (APAC) region. In APAC, engagement improved by three points to 65%, led by the region’s largest countries – China (+2 points), India (+2 points) and Japan (+2 points). Three of the smaller markets also contributed to APAC’s rebound – Malaysia (+4 points) and the Philippines (+6 points) achieved outlier status, while Indonesia improved an incredible 15 points over the previous year. However, engagement in Singapore and Hong Kong stayed flat, while three of the region’s biggest markets saw engagement drop – Thailand, Australia and South Korea each declined by a single point. On the other hand, employee engagement is highest in Indonesia at 76%, followed by India (71%) and Philippines (71%). According to the Aon study, there is a need for Singapore employers to look into engaging the Millennial workforce. Only 56% of the full-time millennial workforce in Singapore is engaged – a two-point drop from last year. To make things worse, the portion of actively disengaged millennials increased by 2%. At the same time, perception scores fell by 3 points in the area of employer brand, and plummeted by seven-points in the area of ‘work tasks’ (the organisation’s ability to fairly distribute the workload and an employee’s sense of enjoyment and accomplishment from the work they do). Digging deeper, Aon’s study found that in Singapore, ‘career opportunities’ topped the list of engagement drivers, followed by ‘senior leadership’, and ‘enabling infrastructure’. While ‘work/life balance’, and ‘talent and staffing’ rounded off the top five. 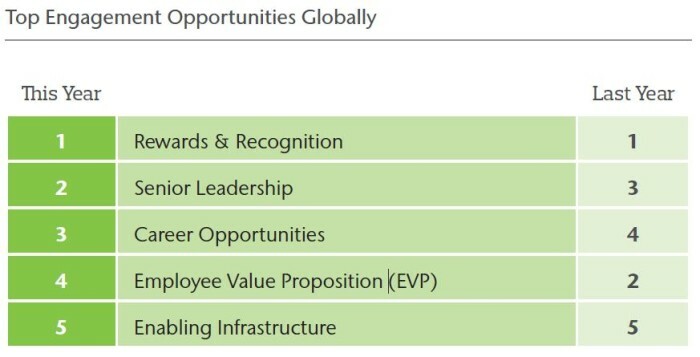 Whereas globally, ‘rewards and recognition’ was the top engagement driver for two years in a row, while ‘career opportunities’ ranked third. How many square feet of office space in Central can you rent on your salary? If your boss has an issue with social media in the workplace, you might want to tell them to read this article. ..